Every time I hear the statistic that 92% of people don’t stick with their New Year’s Resolution, I think can that really be right? I am on day 23 of mine and so far so good. Today I’m going to pledge to MegaFood how I will close my nutritional gap and help cure nutritional poverty at the same time. Join me! Eating healthy. This is my biggie that I am really focusing on. I normally cook healthy meals, but I’m taking it a step further to be mostly gluten and dairy free and really watch the sugar. On January 2nd I committed to the Whole30 diet for 30 days which basically takes out everything! ha! I’ve struggled, but kept on track. Let’s go back to taking daily vitamins for a minute. I have really enjoyed adding MegaFood MultiVitamins and Booster Powder to my daily routine. Sometimes I feel guilty if I’m not getting in all the right kinds of nutrients each day and I really have to be reading labels with everything. 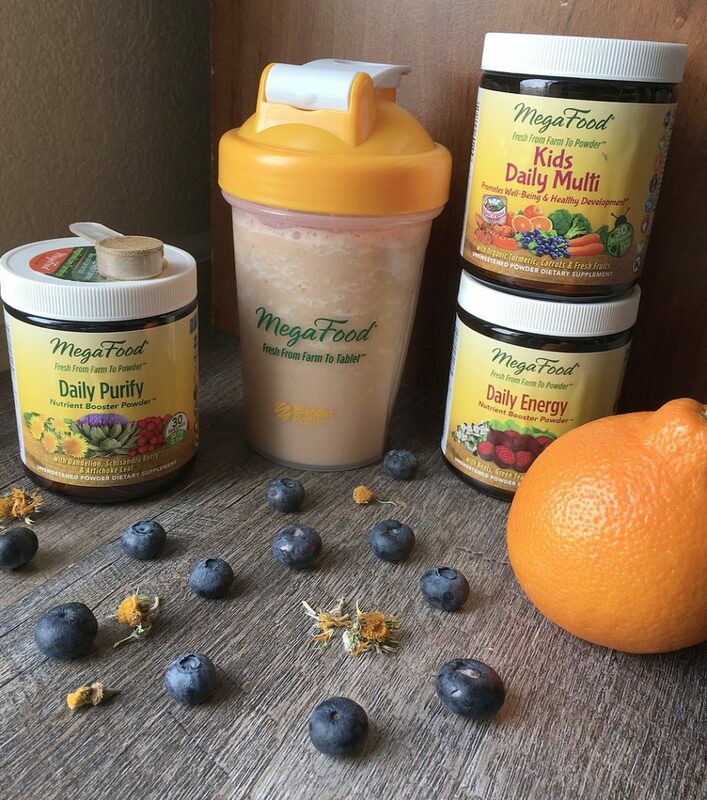 MegaFood is farm to table whole foods in pill and powder form. There is no added sweeteners which is super important to me! Simple ingredients that you know and understand. The shake bottle above contains an orange, banana, almond milk mix with a scoop of Daily Purify which contains…are you ready to hear this..artichoke leaf, burdock root, dandelion root, beet root, broccoli, cabbage, parsley, reishi mushrooms, berries and oranges. I feel great knowing all that is now in my drink! Even the kids are loving that they have their own powder to add to a smoothie, though I won’t be telling them about the carrots in there! For every pledge MegaFood collects on how you will close your nutritional gap this year, they will donate a bottle of MegaFood Multivitamins to those in need. Also, all pledgees will receive a $5 off coupon AND be entered to win a year’s supply of MegaFood Multivitamins and a trip to a wellness retreat! Also join MegaFood for an upcoming Facebook Live chat that is taking place on February 7th. The Facebook Live will be their official pledge launch and will be filled with broadcasts from some very special guests. Tune in! 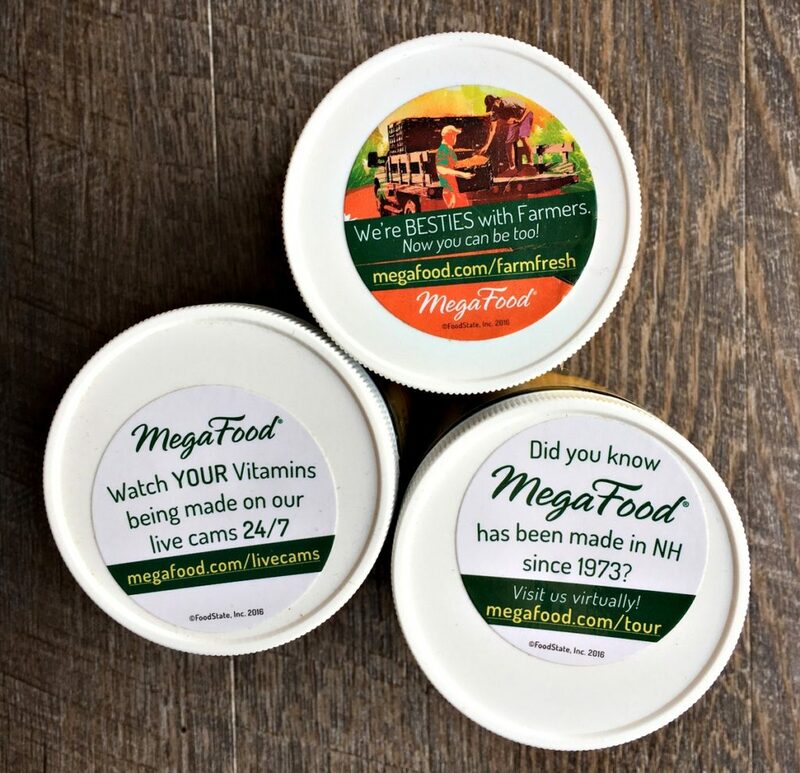 You can find MegaFood at a natural grocer near you or on Amazon. 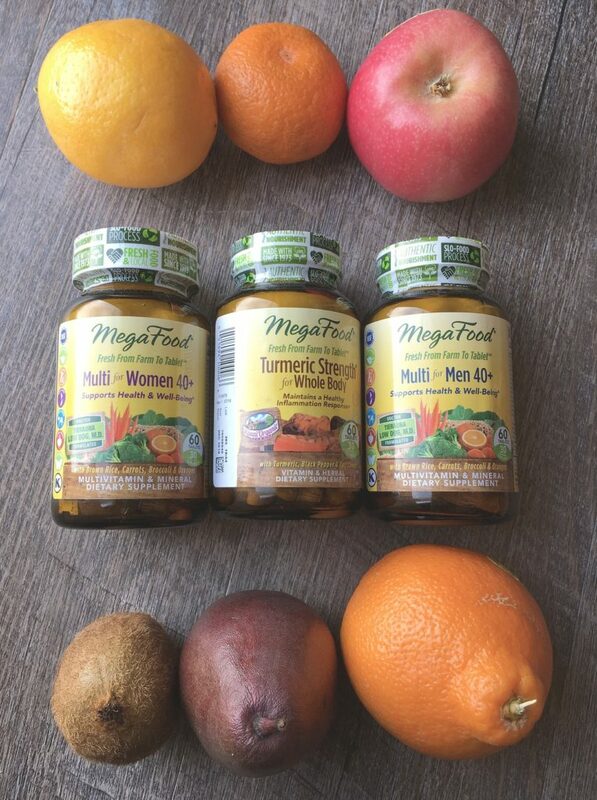 WIN 2 bottles of MegaFood Multivitamins of choice! I partnered with MegaFood for this post. All opinions my own. Links may be affiliate. This giveaway will end on February 17, 2017 at midnight MST. Winners will be drawn via rafflecopter. Once a winner is drawn I will contact them and they will have 48 hours to reply before I draw a new winner. Giveaway is open to anyone in the US. You must be 18 years of age or older. Giveaway is not affiliated with Facebook & I release them of liability. Winner will be posted in the rafflecopter widget. Give the Gift of Chuck E Cheese Giveaway ~ 2 Winners! More kidney beans/spinach --foods that prevent anemia. I pledged to stop eating refined sugars, that is my resolution for this year. I will pledge to drink more water, eat more vegetables and take my vitamins! Hubby and I have been working on cutting our all the "junk" food we eat and replacing it with fruits and veggies. We have a long way to go, but we are heading in the right direction. I have pledged to myself to sit less and move more every day. I want to pair moving more with healthy living and daily vitamins. I pledge to take the supplements I need to fill the gap in my nutrition. We have been adding fruits and vegetables to every single mean, and going meatless twice a week. We take supplements too. I pledge to eat more fruit every day. I pledge more beans and lentils. I def need more vitamin D and less processed foods. I don't use social media, so official pledge is out. However, I just wanted to say I got turned on to MegaFoods Blood Builders after a low point in my health last year. Was lucky enough to run into a MF rep at a Whole Foods & we spoke at length about my underlying nutritional needs. Just last week I picked up 3 additional MF suppies, & have all the faith that they will help get my immune issues sorted. This is one prize I would not only luv to be blessed w/, but need as well. THIS! This sounds perfect as I do not want to take synthetic vitamins and these are awesome! As a new diabetic, I'm all about getting more veggies in. Fruit not so much, unfortunately, due to the sugar. I pledge to eat more healthy fats! I took the pledge! The pledge count didn't change though...think it's broken because I highly doubt there have been only 8 pledges! I am eating more veggies and drinking more water. I enjoy looking at your site and would like to win the vitamin giveaway. ' Thank you for the promotion. I PLEDGE MORE WATER AND VEGS. I pledge to drink more water. I have not in the past drank a lot of water. I eat lots of veggies, but I pledge to eat more fruit, too! I make sure that I feed my family both orange and green veggies every day as well as at least 1 serving of fruit every day! I will try to eat more fruits. I am trying to give up the chips and the ice cream. I pledge to eat more protein and not so much bread and butter... AND a lot more veggies. It IS easy to do veggies with a fruit smoothie, I don't have an excuse really. I am pledging to cut out sweet tea! AH! I am trying to get back into the habit of taking vitamins daily again. I am trying to eat more fruit and veggies and less red meat. I pledge to eat more vegetables. I pledge to exercise more. We are trying to eat healthier. I would like to cut out soft drinks! I pledge to eat healthier and exercise daily. I've been trying to do at least 10k steps a day. I pledge to avoid gmo's and eat organically. Nuts and seeds are a great way to add minerals. I already try to eat healthy and exercise. I plan to continue doing that. I bought a FitBit recently and I love that it motivates me to move more! I always use the stairs instead of the elevator. I'm definitely trying to be more active and remember to take my vitamins! I am being more careful with what I eat and drink now. I am pledging to work out at the pace that I used to. 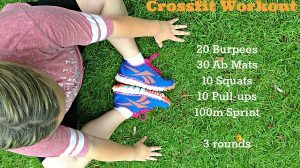 My workout routine is not as good as it used to be. My goal is to swim 3 times a week. So far so good. Thanks for the contest.